Synopsis: Frank Fisher (Nick Offerman) has been running his record store in Red Hook, Brooklyn, for over a decade. A one-time musician, Frank's life changed when his wife died in an accident and left him to raise their only daughter Sam (Kiersey Clemons), who has recently been accepted to a pre-med program at UCLA and is about to leave the nest. As if the prospect of seeing his daughter move away isn't enough, the record store is losing money, and Frank is forced to tell his friend Leslie (Toni Collette), who is also his landlord, that he's going to close up shop at the end of the summer. Aside from hanging out at the bar owned by his buddy Dave (Ted Danson) and taking care of his aging mother Marianne (Blythe Danner), Frank doesn't seem to have much to look forward to. One night, Frank distracts Sam from her studies and encourages her to join him in a long overdue "jam sesh"– Sam has grown up playing music with her father, and also sings as a hobby. She pulls out some lyrics she's been working on, and together they spend the night crafting and recording a song together. "We're not a band!" she says to Frank the next day, squelching his excitement. But Frank is inspired by his daughter's talent, and impulsively uploads the song to Spotify under the band name "We're Not a Band." Much to Frank and Sam's surprise, the song is placed on the popular Spotify "New Indie Mix" playlist. For Frank, the world opens up for him again, as he starts to imagine a future recording and even performing live with Sam, if only he can convince her. But Sam has ambitions of her own, already complicated by a growing relationship with her new girlfriend Rose (Sasha Lane), and these make a music joint music endeavor career seem all but impossible. As the summer comes to a close and college beckons, Frank and Sam must make some choices, and find a way to transition into their new lives. When I first met my writing partner, Marc Basch, he asked me what kind of movie I'd most like to make. I'd replied without hesitation, "A musical." I grew up doing musical theater at my high school in Pensacola, Florida and it was through productions of "Anything Goes", "Funny Girl", and "Into The Woods" that I discovered I wanted to be an artist and a storyteller. 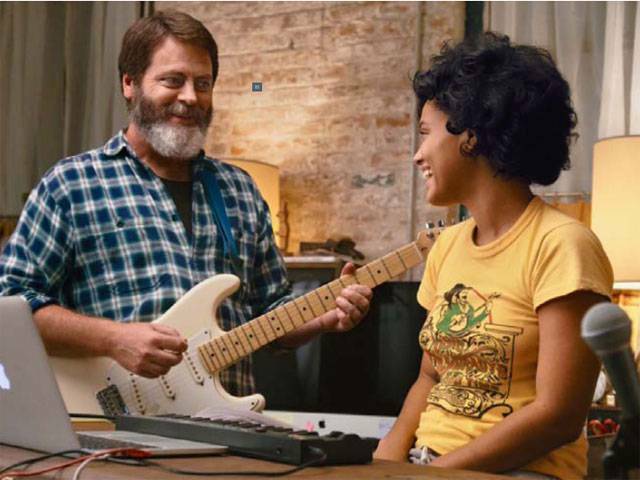 Hearts Beat Loud isn't exactly a musical. But it's the kind of musical I've always wanted to make - one in which the songs are grounded in real-life situations. There's no breaking out into random song and dance, but the story is still told through songs, and through the musical beats of the characters writing, rehearsing, recording and performing those songs. Music is the mode of communication for these characters, the language they know and speak best. The obvious challenge of pulling off a music-driven film was that we needed original songs. Great ones: because if they weren't great, the movie wouldn't work. Keegan Dewitt had composed the scores and original songs for my previous two films - and, in addition to being in the band Wild Cub, is an accomplished solo artist. I've always loved Keegan's music. I call him "The Wizard," because there is literally nothing I've ever asked him to do that he hasn't been able to deliver. I knew he would understand the emotional journey we needed to convey, and as expected, he immediately "got" it - and knocked it out of the park. The four songs he wrote, including the title track, are the lifeblood of the film, and are great enough to stand alone as pop songs. Without these songs, this wouldn't be a movie. Given the level of anxiety in the world right now, it was very important to me to make a film that makes people feel good, and that reminds people of the simple goodness in the world and in ordinary life. Hearts Beat Loud is about love, acceptance and the power of creation. My goal was to create a film that makes people smile, and comes by that honestly. And just like a "real musical," my hope is that the film is a deeply felt, shared emotional and uplifting experience for all those who see it.